YardMax Rechargeable In-Ground Fence maximizes the amount of yard you pet can play in. You just bury wires in your yard to set your pet's boundaries. When your pet nears the boundary, the collar will give a warning beep, followed by a static correction to remind your pet to stay safely in your yard. YardMax Rechargeable In-Ground Fence maximizes the amount of yard space for your pet to play freely in. Our most reliable and advanced In-Ground Fence system keeps your pet in your yard with a transmitter and rechargeable collar. You'll bury wires in your yard to set your pet's boundaries. When your pet nears the boundary, the collar will give a warning beep, followed by a static correction to remind your pet to stay within the boundaries. Your pet will be enjoying greater room to roam in no time! How much wire do I need? 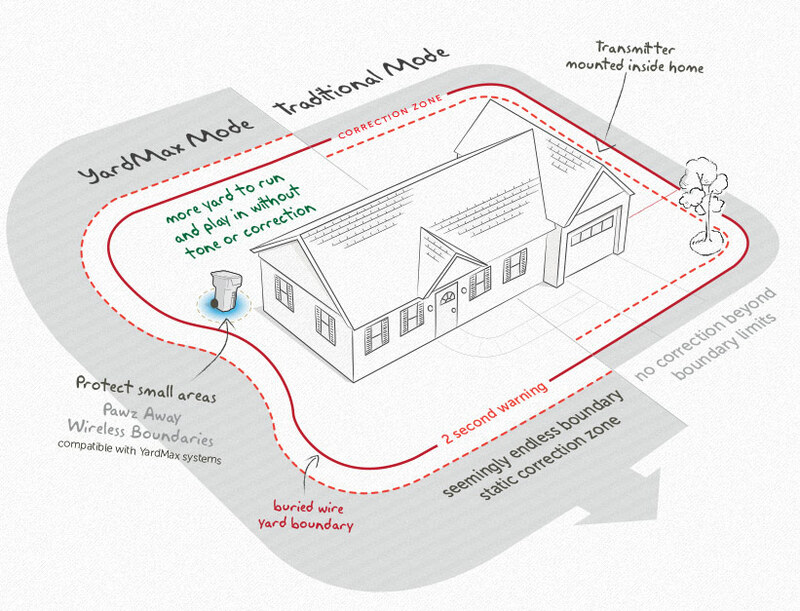 In YardMax Mode, the Warning Zone begins on the other side of the boundary instead of within your yard, giving your pet more yard space. The Boundary Zone continues past the Warning Zone indefinitely, so your pet can't run past the Boundary Zone. Your pet will receive corrections from the collar until he returns to the Pet Area, or until the safety time-out activates after 15 seconds. This helps your pet learn exactly where his boundaries are. When you purchase a YardMax Rechargeable In-Ground Fence, you can get any of our compatible Pawz Away pet proofing barriers for 15% off. Add the YardMax Rechargeable In-Ground Fence to your cart along with any Pawz Away system to save 15% on Pawz Away pet proofing barriers. Not only can you give your pet safe boundaries outside, but now you can also teach your pet to stay away from the couch, counter, or trash inside. You can even keep pets away from the garden or pool outside. It's also great for giving certain pets access to areas while keeping more mischievous ones away. The best part is your pet can wear the same rechargeable collar everywhere. You can relax knowing they're playing safely in the yard or house without getting into trouble.